I have a very limited supply of some of these stickers, more of others. First come, first served. All stickers are 11.5 x 3 inches. Domestic shipping is free. Click on the price box arrows for a dropdown menu of other options. 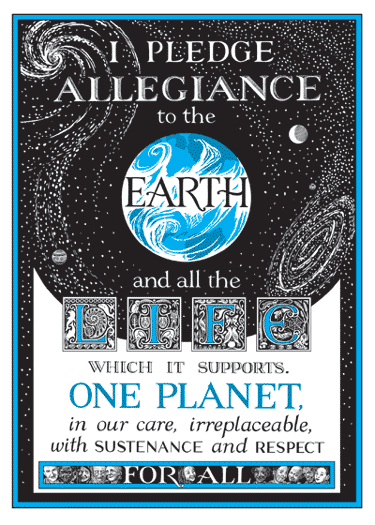 I am no longer selling cards and posters on this website, except for the ﻿Earth Pledge poste﻿r﻿. I have only a handful of the posters left. I still have 5 x 7 Earth Pledge notecards available for a limited time. I will be selling many of my posters again on a new website, as well as some rocking new designs on t-shirts, so stay tuned. If you would like to stay in the loop, please add your name and email address to the contact list form below. I made the Earth Pledge image 20 years ago. Its meaning is still current and still needed. This poster made Glenn Beck barf on his TV show. Note: Click on the price box arrows for a dropdown menu of options. My Paypal system is set up to add shipping to orders from many countries. If you place an order and there is no shipping charge added, it means I am not set up for your country. If that happens I will refund your money, figure out the correct shipping charge and then I will ask you if you would like to reorder. If you have any questions, please contact me. Please join my mailing list.